Only four teams remain in FIFA’s football global showpiece. World Cup 2014 host Brazil, Colombia, Netherlands, Costa Rica, France, Germany, Argentina, and Belgium are in the quarter final stage, after beating out their respective second round opponent. 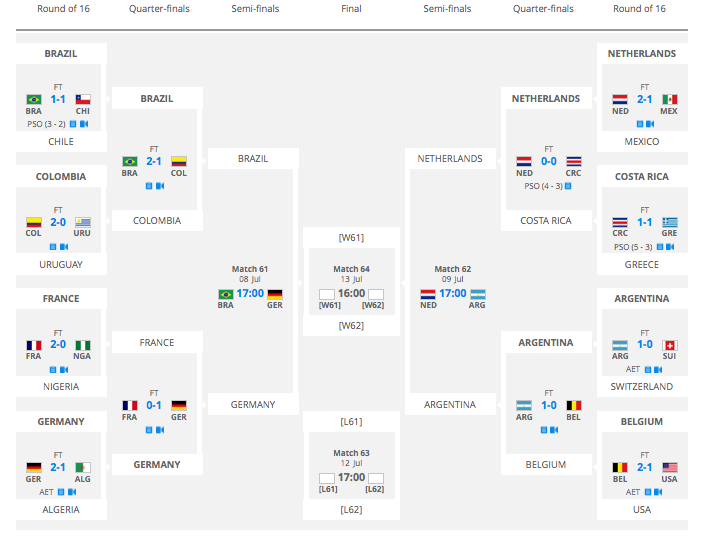 So far, Germany, Brazil, Argentina, and Netherlands have progressed to the semi finals. Here is how the tournament bracket stands so far. Check out the fixtures for the round of 16 below. Odds are per OddsChecker.com. Prediction: France beats Germany 3-1. Prediction: Colombia to upset Brazil 2-1. Result: Brazil beats Colombia 2-1. Prediction: Match to end 0-0 after extra time. Argentina wins 5-4 on penalties. 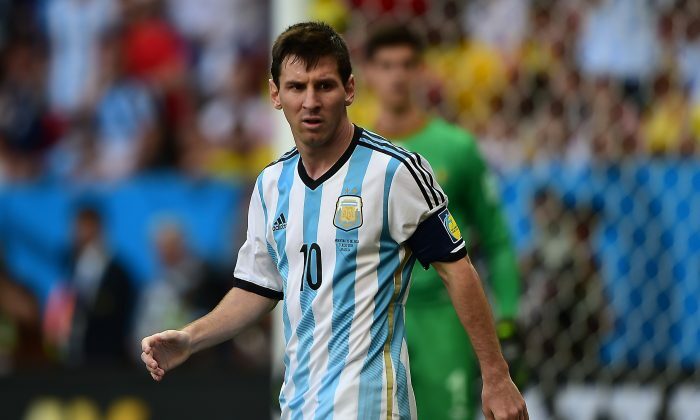 Result: Argentina beats Belgium 1-0. Result: Netherlands and Costa Rica drew 0-0 after extra time; Netherlands won 4-3 on penalties. See an Associated Press article below. RIO DE JANEIRO (AP) — The fireworks celebrating victory had barely subsided when the disastrous news came through for Brazil: Neymar is out. The star who lit up the World Cup with his skill and sunny temperament fractured a bone in his back. The only way for Brazil to win now will be without him. The home side muscled past Colombia 2-1 on Friday into the semifinals. But making the step from there to the July 13 final will be much harder for Brazil without its 22-year-old goal scorer. Team doctor Rodrigo Lasmar said Neymar fractured his third vertebra when he was kneed in the back by Colombia defender Juan Camilo Zuniga. Brazil has shown grit under the intense pressure of home expectation. But getting past its next opponent — Germany — will be a big task without the genius of Neymar. After swashbuckling, end-to-end games in earlier stages of football’s showcase, Friday’s quarterfinals were like having to eat one’s greens. Neither match will be remembered as a classic. But they were instructive. The enduring image will be that of Neymar being gingerly rolled onto a stretcher and carried away in pain. Incredibly for teams that have won eight World Cups between them, the Germany-Brazil semifinal next Tuesday in Belo Horizonte will be just the second time the nations have met at the showcase tournament. Brazil won the first meeting: 2-0 in the World Cup final of 2002. As well as Neymar, Brazil will also be missing Thiago Silva, its captain, after he picked up his second yellow card of the tournament for fouling Colombia goalkeeper David Ospina. Before word of Neymar’s injury filtered through from the coastal city of Fortaleza, there had been sighs of relief across South America’s largest nation as Brazil sent home one of the most exciting teams and its electric young talent, James Rodriguez. On Rio’s Copacabana beach, joyful fans jumped and screamed. While Brazil’s match was a scratchy, high-octane affair, Germany’s 1-0 victory over France at Rio’s Maracana Stadium was cagey and methodical. Germany is desperate for the trophy after more than a decade of just missing out on success. Defenders scored three of the four goals Friday. France’s forward line came up empty and Brazil-Colombia didn’t quite live up to its billing as a battle of Rodriguez versus Neymar. Mats Hummels headed in Germany’s winner in the 13th minute. Brazil’s center-back pairing of Thiago Silva and David Luiz got the goals that meant they have still yet to lose when coach Luiz Felipe Scolari has started them together. Luiz’s goal was the most spectacular of the day — a free-kick Brazilians call a “dry leaf,” because it arched over Colombia’s defense and back down past Ospina. Silva’s opener for Brazil came off his knee in the seventh minute. Rodriguez put Colombia on the score sheet and made the last 15 minutes uncomfortable for Brazil with a calmly-taken penalty that took his tournament-leading tally of goals to six. Germany lacked zip in beating a France team that lacked self-belief. Heat and also a cold bug that swept through Germany’s team after it beat Algeria 2-1 to reach the quarterfinals appeared to take its toll. Coach Joachim Loew earlier said one-third of his players complained of sore throats and Hummels ran a fever. Sticky humidity and early afternoon sun made the cauldron of the Maracana feel hotter than FIFA’s temperature reading of 26 degrees (79 Fahrenheit). Fans in a large section not shaded by the overhanging doughnut-shaped roof were slow to return to their seats for the second half. “Brutally hot,” said German captain Philipp Lahm. At a World Cup where substitutes have starred, scoring a tournament-record 29 goals so far, France got no spark off its bench. Coach Didier Deschamps’ introduction of forward Loic Remy for deep midfielder Yohan Cabaye only stirred the embers of a dying game, without re-igniting it. Striker Olivier Giroud’s cameo, replacing winger Mathieu Valbuena in the 85th minute, was also too late to make a difference. Germany made a big statement with a 4-0 humbling of Cristiano Ronaldo’s Portugal in its opening game. Since then it hasn’t really wowed and its defense was farcical against Algeria, a problem it fixed against France. Like Brazilians, German players have said anything but victory in the final would amount to failure. As well as the 2002 final, Germany also lost the 2006 semifinal to Italy and the 2010 semifinal to Spain after playing dazzlingly in earlier games. It also lost to Italy in the semifinals of the 2012 Euros and in the 2008 final to Spain. In short, since it won Euro 1996, Germany’s record at major tournaments can be best described as close but no cigar. The way Loew’s players closed out the win against France showed they have learned victory tastes better than playing beautifully. —The son of FIFA senior vice president Julio Grondona denied claims he illegally sold a World Cup ticket for profit. Brazilian police are investigating a ticket scalping operation and have made 11 arrests this week, bringing the issue to public attention. —Rescue workers recovered the body of a 25-year-old man crushed beneath tons of concrete and steel of an unfinished overpass that collapsed in Belo Horizonte, killing two people and injuring 22.